The Roosevelt neighborhood plan called for emphasis on this corner to represent the west gateway to the Roosevelt neighborhood. This is a small project with a large role to fill, so all schemes include a tower element at the corner to give the building more of a presence. This scheme incorporated an open air breezeway space between the two buildings at the corner to provide a convenient access from the parking lot and entrances to the retail spaces from the breezeway. This design takes the position that the pedestrian circulation on both streets is too important to obstruct with vehicle circulation and all vehicle access is through the alley. This design achieved the highest density of any scheme by avoiding driveways from the street but the owner felt a direct vehicle connection from the street was important to successful retail space. 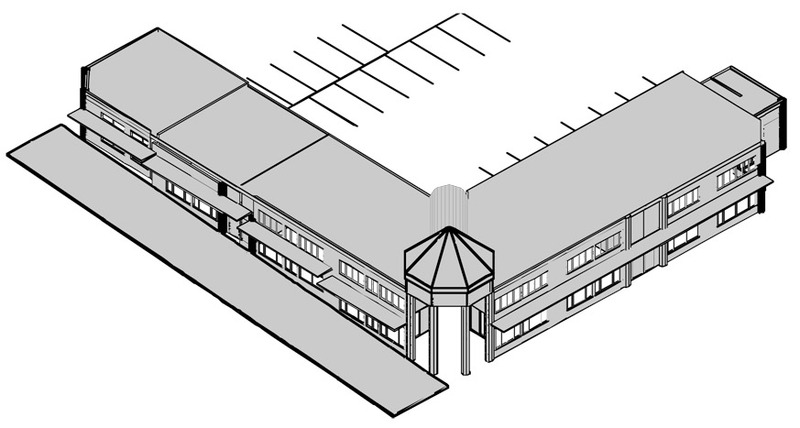 The final design incorporated the pedestrian breezeway concept from this scheme.